This edition of IJVS is focused (sorry pun intended) on the use and applications of vibrational microscopy, which is a collective term for FT-IR microscopy, NIR microscopy and Raman microscopy. The feature that links these and a number of other emerging techniques, is that spectral information is obtained via a modified light or atomic force (AFM) microscope. The ability to view a sample before, after, and sometimes even during a spectral data acquisition is very important in the analysis of microscopic samples and areas. 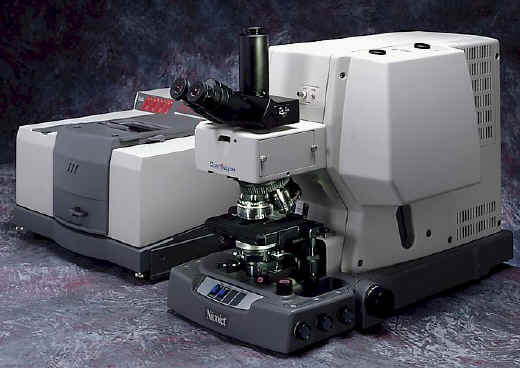 In terms of the IR and Raman spectroscopy being performed, these microscope systems offer a convenient method of obtaining a spectrum from a small sample or area. It can be easy to overlook the visual data that is also available. This includes information such as sample size, shape, colour, morphology, crystallinity, and number of phases present. The combination of these physical properties along with the specificity of the spectroscopic data provides a more complete analysis of the sample than by microscopy or spectroscopy alone. To help set the scene, the following pictures show you what a typical FT-IR microscope and a typical Raman microscope look like. I have had an interest in the technique since the mid 1980’s when I purchased one of the first commercially available FT-IR microscopes in the UK. To date, the purchase justification for that instrument was the easiest I’ve ever had to justify to management. The benefits in non-destructive microscopical sample analysis were obvious to all concerned. My perception since then is that for many of the laboratories involved in investigative analysis today, the FT-IR microscope is now a standard technique in the spectroscopist tool box. 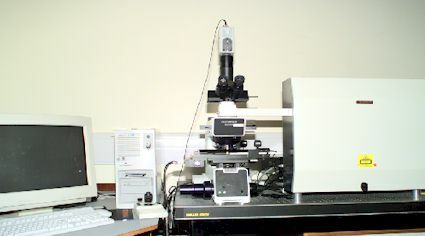 And in recent years Raman microscopy is becoming more widely used. Having given an external presentation earlier this year on developments in microspectroscopy, I was flattered when Patrick Hendra asked me to get involved # with this microscopy issue. Needless to say I now have an appreciation of the effort which goes into producing each edition of this journal. The subjects covered in this edition are the design of FT-IR and Raman microscopes, a personal view on the use and trends in the applications of vibrational microscopy, use of the techniques in combinatorial chemistry and the study of semiconductor materials. It closes with features on FT-IR and Raman chemical imaging, which for me, represents the major application development area in microspectroscopy. The data from these experiments are usually presented in a pictorial manner and provide chemical information about the sample. In very simple terms, these data can be considered as a chemical photograph. The ability to perform routinely non-destructive analysis on solid phase mixtures, (e.g. polymers, biological samples and pharmaceutical products to name but three), and to visually show the location of the components present marks a significant technological advance in vibrational spectroscopy. Through both academic groups and instrument manufacturers, the boundaries of what is possible with microspectroscopy systems is continually being extended. In my opinion this is what makes vibrational microscopy an exciting science to be involved in. My only regret is that these techniques have not made a bigger impact within the microscopy community. Perhaps it’s instrument cost that cause this inertia? However, speaking from experience, I know that when spectroscopists and microscopist share their skills and knowledge there is a significant and positive impact in their studies of microscopical heterogeneous samples and systems. This IJVS edition presents information on what is currently possible in vibrational microscopy. So what about the future? A consequence of imaging experiments is the vast amount of data they produce. Everybody’s experiments will be different, based on sample response, instrument availability, sampling area and spatial resolution. However, one common feature of all these experiments is the vast amount of spectral and image data they produce. I would estimate that most images contain between 1,000 to 25,000 discrete pieces of information. This can equate to file sizes of 40+Mb, so large PCs with hard disc capacity and fast processing speed are essential for handling these large data sets. For many applications the creation of images is relatively easy provided each of the (known) components in the samples has a unique characteristic spectral band. Data analysis becomes more challenging when their are unknowns in the sample, as it is impossible to predict where their unique bands are. Other difficulties arise when the sample components have similar spectra or complex spectra with many overlapping bands. To create meaningful images from these data sets more sophisticated software is required. This software may already exist, but if it does, it is either not readily available or has not yet been applied to these types of problems. (If you know of anything suitable, I’d like to hear from you – don_clark@sandwich.pfizer.com). At the time of writing, the applications of atomic force microscopes and probes to obtain images with spatial resolutions of below the defraction limit are becoming more widely published. Anecdotally, I have heard of the use of future systems to identify each amino residue in order along a single protein strand. If this becomes reality it will open up many new areas and applications of chemical imaging. I hope you find this edition interesting, and I’m sure Patrick would like some feedback and any discussion items that arise from the following articles. If you are interested in learning more about the these and emerging microspectrometry techniques I recommend making contact with the following groups/organisations. The Microspectrometry Applications Group ( MAG) – Affiliated to the Association of British Spectroscopists and the Royal Microscopical Society. The MAG is a UK based discussion group with a goal to promote small sample analysis by spectroscopy through microscopes. It meets twice a year at different locations around the UK as a forum to discuss different areas of applications and new techniques. The group has a triennial award for the best oral presentation at its meeting for young microspectroscopists. To keep all the membership aware of group activities the MAG produces abstracts of all its meetings and appropriate newsletters.. The Molecular Microscopy Laboratory is based at Miami University, Oxford, Ohio under the direction of André Sommer. This group’s work is dedicated to microspectroscopy research, development and education whilst providing a molecular microscopy service to both scientific and business communities. Each year they run an annual course for any one who wants to learn more about these techniques. The next is in June 1999. The views expressed here are personal, and are not those of Pfizer Central Research. Just a couple of things – firstly to those readers who have offered to distribute our IJVS cards. It’s greatly appreciated and very important to our continued drive to increase our readership. Thank you. And if there are any more of you who be able to give out some cards, please contact me mailto:louise@ijvs.demon.co.uk or mailto:ijvs@soton.ac.uk . Secondly, the way we notify readers when each edition is launched has changed slightly and I have been made aware of some errors in a few e-mail addresses that readers have sent us when they have subscribed. This means that when I have tried to notify readers, some messages have been returned as undeliverable. Please make sure that if you wish to receive notification of IJVS that we have the correct e-mail address for you. I would hate to think that there are some readers out there who think that we’ve forgotten them! Lastly, we have had a suggestion that we incorporate a site search engine for IJVS. Which means that if you have a certain topic or item that you wish to read up about and we have featured it, instead of wading through all the archives to see if it’s there, the search engine will locate it for you. However, it’s quite a bit of work involved and we have decided that we won’t implement it until after volume 2 is finished.